Golden Apples: Only the Toe To Go! And I've already gotten a round or two done! Over the past few rows, the stripes-- out of perfect match starting at the beginning of the heel flap-- have worked there way back to matching. They are about half a round out of complete sync—but then, they started that way! Cindy, (aka Random Charm) on Ravelry, comment on my socks and asked about the clock pattern . It's a bit difficult to see the detail on LEGS—so here it is, flat, and stretched. The clock pattern consist of 3 bobbles a simple chevron of lace and a second chevron (slightly larger) that become a lace diamond, and ends right at the point where the flap begins. I have my ideas about socks—I think self patterning and multi color/shade yarn (that doesn't stripe or spiral) looks best in simple, plain stocking knit—with just a few details (like a cuff, or a clock) Occasionally, if the stripe/self patterning is very subtle, a pattern might work. I come to think this way based on my experience—some of my yarn/stitch pattern choices have been, well, less successful. For patterns (be they cable or lace stitch patterns) a solid, or semi solid is a much better choice. I have tried using variegated yarns and striped yarns with patterns-- sometimes things work out OK, (like the Mast Socks) but more often-- like the Child's French Sock--not so well. The yarn in the Child French sock just about totally obscures the pattern. And the Mast socks, show ripples—but its hard to see the acorn lace motif--the back with its applicate d oak leaf and acorn bobbles work much better. Even the simple balloon stitch pattern on the less stripy Lion Brand Cotton Candy socks doesn't really work well. 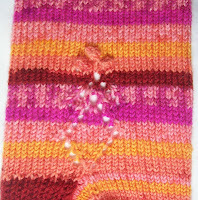 Self striping/self patterning yarns look best when the bulk of the sock is stocking knit. Lace and fancy stitch patterns work best in semi solids. Actually semi and real solid colors work well for any pattern. The Denim socks, and the Garnets in Granite are a both knit with a pretty simple stitch –and look fine. But I don't think the fine lace of a pattern like the peachy socks would look good in stripe—the stripe would fight the lace design for dominance. 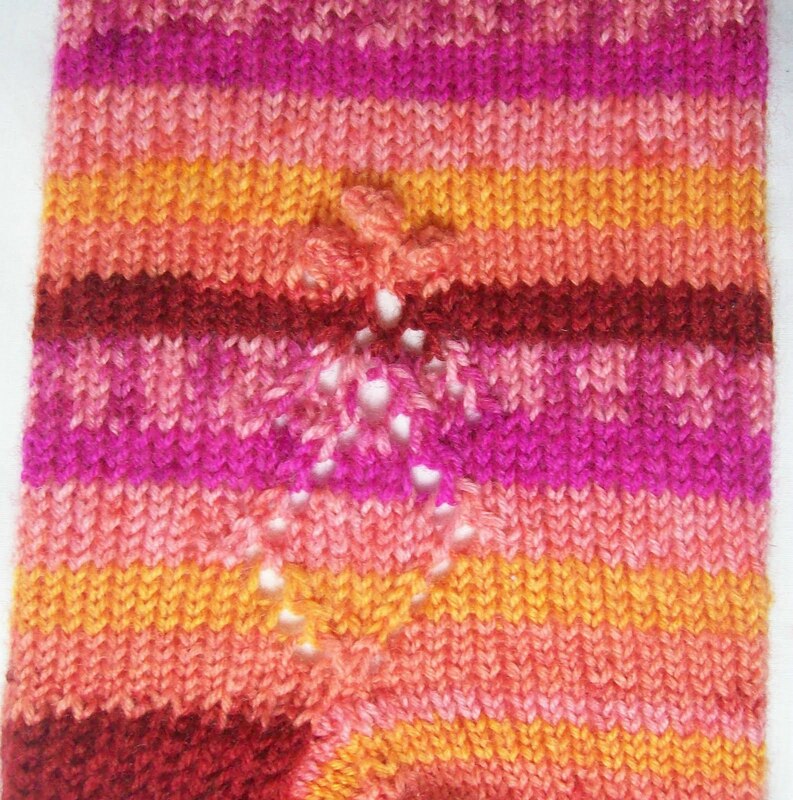 I LOVE self patterning yarns—yet--they can be boring—all that stocking knit. I love solid and semi solid yarns, too. I love the freedom they offer—all the possibilities of design! I don't know which I like best. For sure, I like alternating—fancy patterns, interesting stitches and one of kind designs (with all the planning and weaving in of ends!) and simple socks with just a few details, letting the yarn do the bulk of the work! Crowning Achievement—is a pretty simple plain sock. It has a fancy cast on and cuff—and the small lacy clock—but the bulk of the sock is pretty generic and plain. Next month—an other version—and a bit fancier—when I will knit up (in September, so I can savor them for a few weeks before I ever wear them) my pumpkin pie sock –for Thanksgiving weekend wear. There will have a toasty brown crimped crust(cuff)—and then inches of smooth pumpkin custard. L-Likely, the heel and turn will be in the same beige brown (making a bottom “crust”) maybe even the whole sole. I haven't ever knit a sock with an EZ style replaceable sole—maybe its time I did!